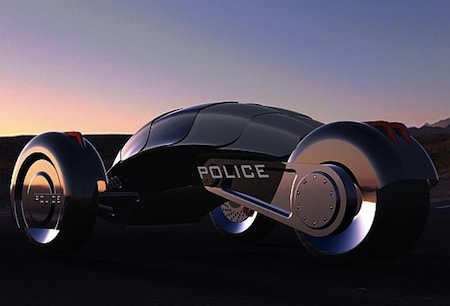 The Scarab is a concept device designed by Carl Archambeault; an all-electric chase vehicle to make high speed chases safer. The idea is that police officers who witness a car speeding can "tag" the car using a radar gun. A signal is sent to the Scarab, which chases the offending vehicle and then pulls it over until officers arrive. The Scarab would be unarmed, but the designer points to technologies that allow police to stop cars by "ordering" the car's engine to stop. Archambeault seems to have science fiction on his mind. SF fans would have no problem identifying both of the key ideas presented in this concept design. 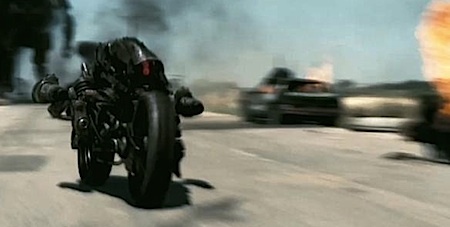 As shown above, the moto-terminator Terminator motorcycles from the recent movie Terminator Salvation are quite similar in concept. Also, fans of the recent novels by Daniel Suarez are probably thinking about the razorback autonomous motorcycles from his 2009 novel Daemon. An unarmed stop of a fleeing vehicle could be accomplished with the police-control override from Keith Laumer's 1965 novel A Plague of Demons and the cop block from Greg Bear's more recent novel Quantico. Via ecofriend; thanks to Moira for the tip on this story (welcome back! ).